The evacuation of wounded and injured personnel has become one of the areas of modern Western land warfare that were the most affected by the extreme desire to minimise the loss of (our) lives. There have even been complaints that all too often MedEvac becomes THE mission once soldiers were wounded, and the original, real mission is only getting pursued once the MedEvac effort has relieved the unit in action off its wounded men. A particularly favoured method of transportation of wounded soldiers is the helicopter, which is by far the safest, most comfortable, quickest and most expensive option. 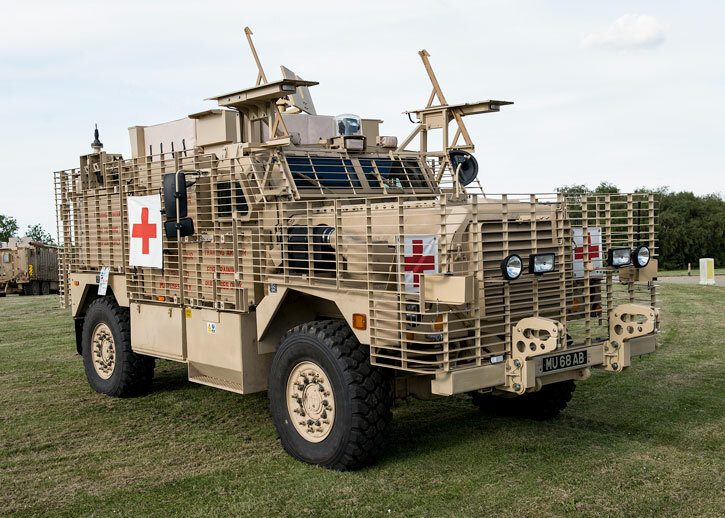 Protected vehicles with red cross and medical equipment have become quite common parts of convoys whenever the troops leave their forts. The classic approach is different: It uses a light lorry or even a car with an enlarged rear cabin with at most two litters (car), up to four litters (~ 1 ton lorry). The comrades apply rather incompetent first aid, then carry the wounded soldier carry him (or support him) back to a designated place where paramedics patch the wounded up some better if needed and give an infusion. Litter cars / lorries wait there or arrive there, take the wounded men (lightly wounded ones sit, badly wounded ones lie on litter) and bring them to a mobile medical unit. The classic approach is somewhat capable of coping with large quantities of wounded men, the gold plated approach isn't. A unit couldn't switch from its mission to a temporary MedEvac mission in a European-style war either; this would render the army terribly ineffective. Maybe it does so in occupation wars as well. 10+ million € army helicopters aren't the only gold plated approach to MedEvac that's bound to fail miserably to cope with the quantities of wounded personnel in a European-style war. 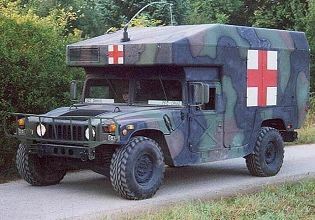 The current medical vehicles of the Bundeswehr include Fuchs, Wiesel 2, Eagle IV, Unimog, Duro 3, Bv 206S, Wolf, Yak and Boxer. This wide range of vehicles is but a glimpse at the chaotic and hardly well-planned vehicle procurement of the Bundeswehr. What's more striking is the Boxer vehicle, though: A Boxer is roomy and can carry seven litters, but its price of about € 3.6 million* is insane and the vehicle is huge. I suppose that field ambulance vehicles are somewhat similar to NBC decontamination sets: It's about time to acknowledge that whatever such support we have or may get in our force structure is only going to be able to deal with the tip of the iceberg when we need them the most. It's not just that we'll never have enough of the gold-plated solutions (helicopters, Boxer, Wiesel 2 etc.) - even the quantity of the relatively affordable vehicles is not going to be great for the simple reason that having a crew or two (driver and medic) in the active force costs well in excess of € 200,000 per year including overhead costs. The Americans seemed to turn away from this quite economical approach in favour of several types of ambulance MRAP monstrosities, but then ordered new M998A3 vehicles only a year ago. I suppose the way to go is to make transport vehicles capable of serving as auxiliary ambulances; what's known as "casualty evacuation" (CASEVAC). Every APC, HAPC, IFV, MRAP, 4x4 car and flatbed lorry should be capable of this. They couldn't use the red cross (particularly not if equipped with a vehicle weapon), but they can provide the necessary transport capacity (quantity of litters), the necessary mobility - and they are usually available near-instantly. There's but one huge problem; many of these aren't really capable. There was a fashion of installing shock protection seats instead of benches in APCs, IFVs and so on, and these non-folding seats don't leave much space usable for litters, or the movement and work of a accompanying medic. Even removable seats don't change this by much because the troops would hesitate to dump the seats, and if they did dump them they might end up with using primitive flatbed vehicles for the remainder of the conflict. The expense for enabling a personnel carrier or flatbed vehicle to serve as an auxiliary field ambulance would be in the low thousands, spent on a medic backpack and a few collapsible litters - the occupied volume would be the greater headache in an APC or IFV. Thus every time I see a protected vehicle meant for transporting a squad of infantrymen I ask myself: Are there benches (folding or doubling as litters) or seats? Where could/should a combat medic bag be stored? Where could/should collapsible litters be stored? Then I end up being disappointed once more. *: 2nd batch ordered recently costs € 476 million for 131 Boxer vehicles, variants not specified. **: US-$ 89.5 million for 654 M997A3 The necessary radio set is likely not inclusive. Funny, I was thinking about the exact same thing the other day. If you require armored vehicles to recover injured personnel, then the zone is probably too hot for any evacuation anyway. Another thing is that big, slow, heavy (and not really all that maneuverable) APCs present a prime target for an opposing force that isn't all too concerned about international treaties. And such vehicles can demonstrate high cumbersomeness on narrow forest roads, which are lined with deep ditches. You can't properly turn around because the road is narrow and you can't just go offroad either, because the ditches will be impassable even for some tracked vehicles. Furthermore, recovery of such vehicles would be tricky and dangerous due to the limited space. Maybe it would be good to have a mix of light wheeled off road vehicles with winches and light tracked vehicles. And the tracked vehicles could be similar to the Bv206. I originally elaborated on the 'Boxer = huge' issue in context of urban warfare and forestry roads, but then did cut this detour. Bxoer's turning circle with skid steering (tears up unpaved forestry roads) is 15 m (I suppose this means diameter). Its length alone is almost 8 m, even pivoting as a hovercraft would hardly be possible on most forestry roads that I've ever seen. Without skid steering it's got a "Wenderadius" of 21 m apparently. You don't want to be confined with this thing or else you'll be a lot in reverse gear at a walking pace. Cannot agree more. Moreover, the percentage of soldiers that are part of the Med/San is increasing more and more. Acutally an unbelievable ammount of german soldiers are for example part of the Sanitätstruppe. We have more San/Med troops than combat troops. Around 20 000 Soldiers alone in the ZSanDstBw + Sanitätsdienst des Heeres + Marinesanitätsdienst + more. The complete Heer (Army) ist only around 50 000 soldiers. For every two soldiers of the army there is one Medic. And they want to grow them even more in the next years. I think this has cultural reasons. Against the "evil" combat troops, everyone like medics who do not kill but save lives that according to our social-culture is a value by itself. In a formation using IFV there's a need for designated medevac vehicles - because the IFV is the main firepower of the infantry squad. However, since the vehicle should be nearby (ideally attached at company level), it better be as well protected as the IFVs. This usually means using the IFV platform, especially when logistics reasons are considered. The leg infantry is trickier. When the infantry is on foot the vehicles most likely to be seen and engaged by the enemy are the medevac vehicles, so using a heavier platform than the norm becomes reasonable. A MEDEVAC version of the IFV vehicle might have four stretchers / litters. Now how many of those would one need to serve a company? Why wouldn't you be bothered by the MEDEVAC vehicle having no firepower at all times instead of one or two IFVs providing no firepower under some circumstances? Also, how would the MEDEVAC specialist vehicles cope with 30+ WIA at once? Because not only those one or two IFVs aren't providing firepower - their squads (and equipment) must be cross-loaded somewhere else, which takes time and effort. And if we're talking mobile combat, those IFV would be full of gear like you wouldn't believe. Now if we're talking 30+ WIA in a single event - the company is screwed and it needs higher-level assistance in any case. The company medevac vehicle can double as the designated maintenance ad recovery vehicle.